When it comes to family fun there is nothing that compares to having a camper, however many people struggle with what to do with that camper when they are not using it and will often look for camper storage ideas. While there is no perfect solution to camper storage needs, there is a need to protect your camper while not in use as simply leaving your camper outside to sit in the weather is not the best idea, especially if you want your camper to last. • Cover Storage: Depending on the camper you own there may be a special cover that you can buy in order to help protect it while it is not in use. These special covers are made of weather resistant materials and are designed to ‘breathe’ which allows the paint on your camper to stay looking great no matter how long you keep the cover on. You can also use tarps if you wish, but they will not ‘breathe’ and are often more trouble than they are worth. • Awning Storage: If you have the space in your driveway for your camper you can still do more to protect it, besides leaving it exposed, when it needs storage. Purchasing an awning that is large enough to provide shade and cover from the elements for your camper is a one way in which you can do just that. While not the best protection in the world, it is far better than simply leaving it outside totally vulnerable. • Garage Storage: Many campers that are small enough can be stored right on your garage. While this seems like a simple solution, the problem often lies in finding the necessary room. However, if your garage is about 100 percent clutter free and your camper is small enough, then you can find safe refuge for your camper there. • Storage Facility: An easy storage solution for your camper would be a storage facility. With a storage facility you can choose whether to leave your camper outside and maybe use a cover or you can rent a spot inside. While the inside spot will likely cost you more, it may be worth it to you to ensure better protection for your camper during storage. The import thing to note here is that you must find a storage unit facility that specializes in camper storage. 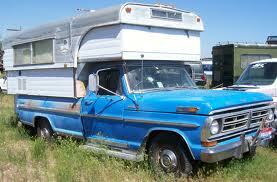 Typically, if they offer RV storage, then you will be covered with your camper as well. Storing your camper while it is not in use really comes down to how well you want it protected and whether or not you want to leave it inside or outside. This will obviously have a lot to do with how much space you have either in your driveway or in your garage. Of course, if you have room in neither then a storage facility is likely the best solution for your camper storage needs.